Well, you know that before you jump into the car and head to the dog park you should pack a few key items to ensure a successful visit. But, did you know that there things you probably shouldn’t bring also? Here is a list of 5 things to consider leaving at home when headed to the dog park. Puppies who are under 6 months have often not been fully vaccinated, and therefore, are vulnerable to getting sick. They are also fragile and prone to accidental injury by the rough play of larger dogs. 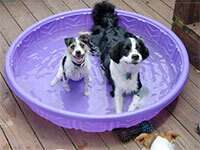 Instead of taking a young puppy to the dog park, look up a puppy play group in your area. Give your young pup a chance to socialize in a much more controlled environment with other pups his/her own size. Unless you bring one for everyone (which could cause a stampede), leave the treats in the car. It’s great to train your dog in the park using treats as a reward, but do it outside the dog park. Food can cause dogs to behave in unusual ways, and if there’s a threat that there’s not enough to go around, full-blown panic can ensue. A great alternative reward system can be treating in the car after a successful muddy paw wipe-down. Again, save your dog’s favorite toy for before and after the dog park. Often, dogs don’t want to share toys and I’m not talking about your dog! If another dog gets your toy, he/she may not want to give it back. Other dogs may also ruin or soil the toy, so keep these kinds of situations to a minimum by avoiding them. Your dog can play with its favorite toy at home, so come to the dog park ready to socialize! Have you ever seen a pack of dogs playing chase? There’s speed, strength, and no sense of manners. The rule of thumb for adults at the dog park is “loose knees,” to avoid being knocked over. Small children can be especially vulnerable to accidental injury by dogs having fun in open space, so try to avoid bringing small children inside the gated area. Your dog is your responsibility at the dog park. Keep your dog safe, and monitor his/her behavior by constant supervision. Going to the dog park with your dog is like taking a child to a pool with no lifeguard. It’s up to you to make sure your dog is having fun and staying safe. In the time it takes you to update your facebook status to “dog-parking it,” a situation could happen that you might be responsible for. Keep your cell phone with the treats and the dog toys (in the car) and let it be YOUR reward after a successful dog park trip!